We are passionate about the next action. We think it’s what drives our lead management software and is the key component – as opposed to CRM – that puts salespeople on the front foot. That is why we have been hard at work creating the noCRM.io Activities feature. If a rep is always clear as to what their next task is in the sales process, there is little reason for them not to act on it. Each lead entered into noCRM.io is automatically set to To-Do. When reps or admin add leads into the system, there is an instant next step. 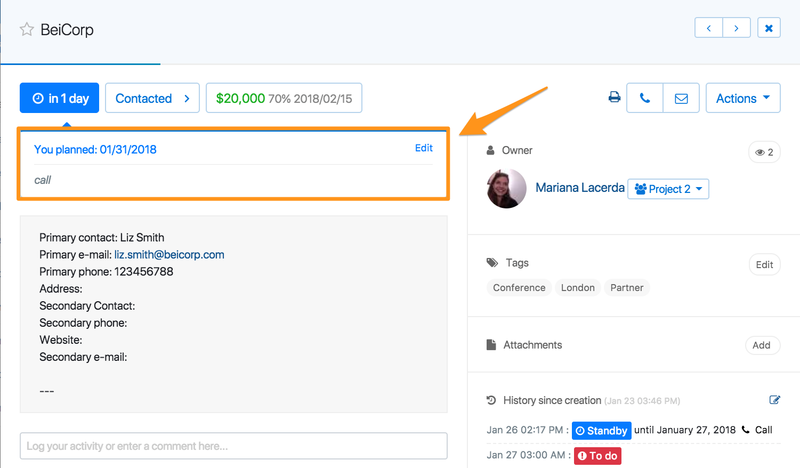 Initially, when creating a new lead, you had the choice of either responding instantly or setting a date for when the next action takes place. The introduction of Activities affords users more options when setting the next action. Not only can you set the date when a next step needs responding to; you can define the exact details of what needs doing by adding a specific activity that you have predefined in your account. It’s easy to immerse yourself in the activities feature and customise it to your needs. Simply head to the Admin Panel and click on Activities. From there you can set the activities you want to display when a lead is created in noCRM.io. Create any activity for a lead – including call, e-mail, and meeting – and set a follow-up action. For example, perhaps you create a lead, and the first To-Do is to make a phone call to the lead. You can then set the outcome of the call to answered, unanswered, or any outcome that is relevant to the lead. 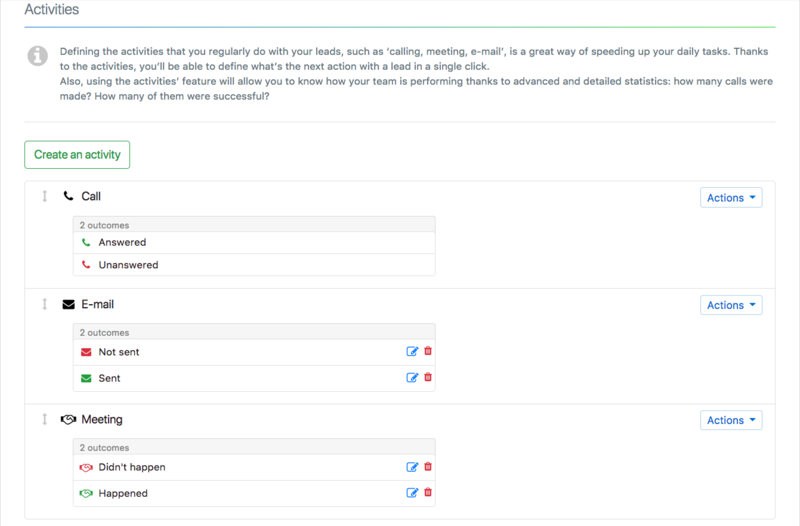 These options help to simplify the process, as reps and managers can easily view what has and hasn’t been done in greater detail. So, you’ve set the activities for your sales process when you create a lead. All that is left to do is see it in action. 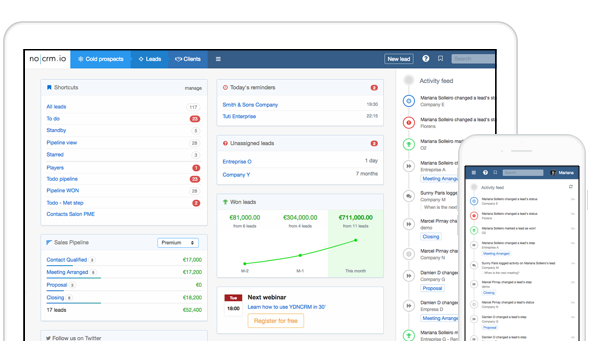 Once a lead has been created and the To-Do is set, there is a drop-down menu which lets users select specific activities assigned to the lead. Then, once the lead has been actioned, set the outcome. Did you win the call? Is there another follow-up, or did the lead decide they aren’t interested? Hopefully, it won’t be the last one! While it’s great to have more control over the detail of how you action leads, it would be even more helpful to have stats regarding the activities. The good news is: That’s exactly what we have done. It is now possible to view the statistics of all your activities in the noCRM.io Activities feature. Go to the Activities page and click on the Statistics tab. Here you can see the amount of planned activities for the selected time frame. You are also able to group statistics by type and see a detailed outcome for each activity. So, there you have it. A host of new activities to get you even more active inside noCRM.io while bring more clarity to your pipeline. The full features of Activities are available in Expert Edition, although a streamlined comments box has been added to the standard version. Check out more info on how the new noCRm.io Activities feature works in our Help Center and watch the video tutorial.